The brazen double speak of most western politicians and media „experts“ knows no limits. In order to justify Israeli violence and maintain the constant portrayal of Israel as innocent victim of the very people it occupies and suppresses since decades, every uniformed Palestinian had to be defamed as „terrorist“ or at least „with terrorist links“. This would apply to almost every member of a Palestinian security organization including traffic policemen of the Hamas rulers of Gaza. At the same time when it comes to the worst violent, militant and at times even antisemitic mob those people are romanticized and hyped as „freedom fighters“ or „activists“ as long as they oppose pro-Russian people, be the latter a democratically elected government or citizens not sharing their anti-Russian views. Whenever any ethnic or religious group in a pro-Russian country demanded secession or separatism US and most western European governments were the first to praise such „freedom movements“ and expect the ruling governments to immediately cede power or allow „reforms“. So, in a new climax of shamelessly biased coverage of events the removal of Ukraines elected government was cheered as a victory of democracy. So, it is legitimate to forcefully remove the regular government, but it is not legitimate for vast portions of the (East) Ukrainian population to oppose the non-elected and thus illegitimate new „government“ in Kiev? There is close to zero logic and military necessity in attacking defensive weapons of a neighboring country that is already stuck in a vicious and devastating civil war. The unprovoked attack on a country with which Israel is (at least officially) not at war does not become any more meaningful or legitimate even if we accept Israels claim that the destroyed weapons were supposed to be transferred to the lebanese Hezbollah. Why is Israel so much concerned about the possible boost of the defensive capabilities of a militia in another neighboring country which has not violated a ceasefire that began 7 years ago? Needles to object to Israels apparently unlimited „carte blanche“ to attack souvereign countries with impunity. This was the fifth or sixth such attack on Syria which Israel itself did not officially admit and which did not subject Israel to any criticism by the international mainstream media or by more or less unconditionally supportive western states. This is a disgraceful manifestation of blatant double standard. Just imagine Iran would attack a military airbase in Croatia to destroy weapons that were (allegedly or really) about to be shipped to Syrian rebels. Or Syria would attack a military convoy on the Turkish side of the border claiming it were carrying weapons for rebel fighters in Northern Syria. Nato would have declared war on Syria and each and every media outlet would have torn Assad apart. a) Provoke Syria to make the „mistake“ to retaliate, thus giving Israel and probably also Obama the pretext to unleash massive air raids on Syrian army positions and weaponry in order to help the rebels win a fight that they would not win otherwise in the short and mid term. b) and this is much more important and relevant: „bomb“ Rouhani, his charm offensive and any perspective of US-Iranian rapprochment. Humiliating Syria and Assad once again is meant to provoke Iranian hardliners to undermine and defame Rouhanis peace initiative. 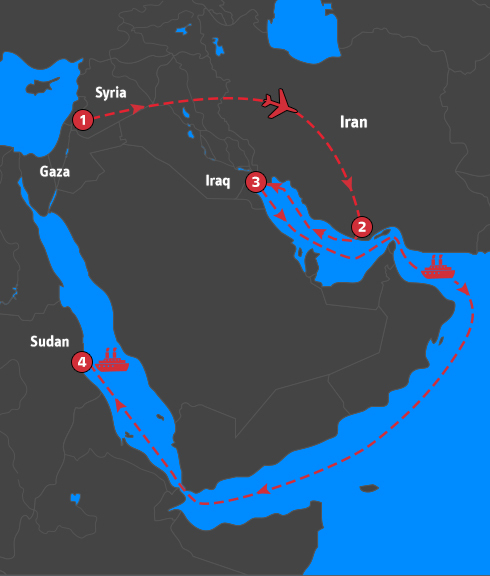 Rouhani would be portrayed as a traitor and weak if he and Iran would ignore continuous unjustified attacks on Irans most important arab ally by the US´ most important anti-Iranian ally Israel. The attack and also it´s time of occurrence – on the day the Organisation for the Prohibition of Chemical Weapons (OPCW) said all Syria’s declared equipment for making chemical weapons had been destroyed – is no coincidence. Israel is the true and most active systematic „destabilizer“ of the Middle East and currently Israels number one priority is to achieve Rouhanis failure.